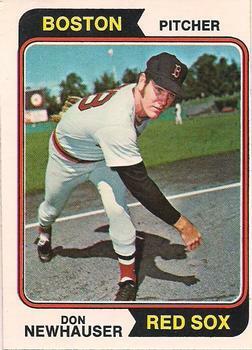 Right-handed reliever Don Newhauser joined the Boston Red Sox during the pennant drive in 1972. He contributed a 4-2 half-season, with a very good ERA, but appeared only briefly in the two subsequent years. He attended Westview Elementary School and Westview Junior High, then Pace High School. He completed two years at Broward Junior College, Dubbed a “strikeout artist” because he’d struck out 19 batters in a nine-inning game and 15 in a seven-inning game, Newhauser had caught the eye of Boston Red Sox scout George Digby. After completing two years at Broward Junior College, the 19-year-old was selected in second round of the January 1967 amateur draft and signed on April 30, 1967.2 That summer Newhauser pitched for the Greenville Red Sox in the Class-A Western Carolinas League. Newhauser was 7-9 during his ’67 season with Greenville, working in 89 innings and striking out 80 while walking 44 and compiling a 2.73 earned run average. That winter he played in the Florida Instructional League, then returned to Greenville in 1968 putting up nearly identical stats: 5-8 with 86 innings, striking out 88 and walking 42 with a 2.62 ERA. Unlike many pitchers, who began their careers as starters and were converted to become relief pitchers, Newhauser was a reliever from the beginning, only starting five of his 33 games in 1967 and seven of 31 in 1968. A few years later, in 1972, he explained that he himself chose to become a reliever: “I spent too many sleepless nights waiting to pitch regularly. So I asked to be a relief pitcher.”3 The year 1969 started with his marriage to Linda Tymms the day after Valentine’s Day. With the Class A Winston-Salem Red Sox (Carolina League) he appeared in 40 games, starting five times. “I was a short reliever. In ’69, I was throwing good. I threw a sinkerball and my ball was really sinking in 1969. 11-3. Real low ERA. I had 109 strikeouts in 105 innings. I had a good year.” Indeed, baseball statistics bear out his memory. Newhauser was indeed 11-3 with a minuscule 1.11 earned run average. In 105 innings, he had struck out 109 and walked 49. He’d gone to winter instructional league but then had arm problems. A bone chip was discovered on his elbow and it needed to be surgically removed. In 1970 we worked only 25 innings with Winston-Salem. He was 3-1 with a 5.40 ERA. In 1971, Newhauser pitched more, but bore a lighter load — 46 innings for Winston-Salem (4-2, 1.37) and then 37 innings for the Triple-A Louisville Colonels (4-1, 3.89). In April 1972, Newhauser returned to the Colonels. Manager Darrell Johnson said he thought Newhauser had fully recovered from his surgery and would be ready to head up the bullpen crew.4 He got off to a decent start and was 2-1, with four saves, in 35 innings for Louisville (3.60, with 35 strikeouts.) When Ken Tatum was sidelined by a troubled sciatic nerve in early June, the Red Sox called Newhauser up to the big leagues. Newhauser’s big-league debut was on June 15, 1972, at Fenway Park. The Kansas City Royals had scored seven times off starter Sonny Siebert, but Boston had pulled to within a run in the bottom of the sixth. Manager Eddie Kasko asked Newhauser to pitch the top of the seventh. He struck out the first batter he faced, then gave up a single and a ground-rule double. An intentional walk loaded the bases and set up a possible double play or a force at any base, but Richie Scheinblum singled. Just one run scored, but after Bill Lee relieved Newhauser, a double drove in two more, both charged to Newhauser. In his seventh appearance, on June 29, Newhauser had his first decision, a loss. The Red Sox had a 4-0 lead over the Tigers. Lynn McGlothen relieved to pitch the top of the ninth, but after two runs had scored and there were runners on first and second with just one out, Kasko called on Newhauser. A single and a double resulted in the game being tied. Bill Lee replaced Newhauser and, after a walk and a strikeout, gave up a grand slam to Bill Freehan, two of the runs charged to Newhauser. In July he appeared in eight more games, picking up a hold, a save, three wins in a row — on July 20, 21, and 28 — and then another save. On July 20, the Sox won the first game of a Fenway doubleheader, 2-1, over the Oakland Athletics. Game 2 was tied, 3-3, after nine. Newhauser was asked to hold the A’s. He hit the first batter in the top of the 10th, but got out of the 10th and retired the side in order in the 11th. Boston loaded the bases in the bottom of the 11th and Carl Yastrzemski walked in the winning run. The very next day, the two teams squared off again and it was 4-4 after nine innings. Ken Tatum had returned and he began pitching the 10th, but after a walk, a bunt single, and an error by Tatum loaded the bases with nobody out, Kasko called on Newhauser. He induced a fly out to second base, then struck out back-to-back pinch-hitters. The 11th, 12th, and 13th resulted in neither team scoring. In the top of the 14th, Newhauser walked the bases loaded, one of the walks intentional after a sacrifice. He then struck out the new two batters. In the bottom of the 14th, Yaz came to the plate once again, with a man on first base, and the winning run scored on an error by second baseman Sal Bando, with Yaz’s drive caroming off him into right-center field. He gave up a run and lost a game on August 11. He won another one on August 26. Newhauser finished his rookie season with a 4-2 record and a 2.43 earned run average, having worked 37 innings in 31 games. The Red Sox challenged to the end, but finished in second place, just a half-game behind the champion Detroit Tigers. By late May, the Sox brass decided they had made a mistake and optioned Lynn McGlothen to the PawSox, calling up Newhauser on May 25. He worked 12 innings without giving up a single earned run, and only four base hits. He had no decisions, but had one save. He was unfortunately being hampered by physical issues. On July 14 he was seen at Hahnemann Hospital for what was thought to be a possible disc problem in his back. Surgery was initially contemplated, but rehabilitation was ordered instead. He was reactivated and added to the 40-man roster when rosters expanded on September 1, but did not pitch again in 1973. In October, however, it was deemed that surgery was required and he had spinal surgery in mid-October. In 1974, Newhauser relieved in 27 games for Pawtucket, with a 2.09 ERA. That winter he went to Puerto Rico to pitch but was unable to get in much work due to a sore arm. The next year he relieved in 66 games wih a 3.49 ERA.In 1976, he was signed as a free agent by the International League’s Charleston Charlies, part of the Pittsburgh Pirates system.9 Working in 32 games, all in relief, he was 5-2 with an even 3.00 ERA. After that, Newhauser left baseball. What did he do after baseball? “I had a rough time,” he says. “I’d done something all my life and was used to it. You’re changing your career when you’re in your mid-20s. I only had two years of college and I was married with two kids. I couldn’t afford to go back to school. I ended up working for a grocery wholesale company. I worked my way up through that organization into national sales. I did well with the company. I got into sales, then became a sales supervisor, a sales manager, and then got into national sales. This biography was reviewed by Norman Macht and fact-checked by Chris Rainey. In addition to the sources noted in this biography, the author also accessed Newhauser’s player file and player questionnaire from the National Baseball Hall of Fame, the Encyclopedia of Minor League Baseball, Retrosheet.org, and Baseball-Reference.com. Thanks to Rod Nelson of SABR’s Scouts Committee. 1 Author interview with Don Newhauser on September 24, 2018. Unless otherwise indicated, all quotations from Don Newhauser come from this interview. 2 “Red Sox Land Strikeout Artist,” Nashua Telegraph, May 1, 1967: 12. 3 Clif Keane, “Red Sox Summon Reliever Newhauser,” Boston Globe, June 13, 1972: 49. 4 “Returning Mound Staff Bolsters Colonels Hopes,” Lexington (Kentucky) Leader, April 12, 1972: 17. 5 Ray Fitzgerald, “Sox Rally for 10-8 After 5-4 Loss to Wood,” Boston Globe, June 18, 1972: 81. 6 Bill Liston, “Sleepless Fans Dream of Pennant,” Boston Herald, July 23, 1972: 64. 7 Clif Keane, “’That Kid Pitched Like Mad’ — Kasko,” Boston Globe, July 22, 1972: 22. 8 Fred Ciampa, “Rookie Newhauser Makes Red Sox Pennant Threat,” Boston Herald, August 1, 1972: 24. 9 “Minor Deals,” The Sporting News, June 19, 1976: 44.